Available from Sunday 22 January, 2006 at 10:00am. *A part of "Seat F" (¥3,150) : Sold at the NNTT Box Office and all Ticket Pia outlets on the performance date only. Up to 2 tickets per person. No phone reservations. *Seat Z(\1,500): Sold to students only at some Ticket Pia outlets on the day before the performance. Any tickets not sold by the performance date will be released to the general public at the NNTT Box Office and some Ticket Pia outlets. One ticket per person. No phone reservations. Students must bring a valid student ID. *Same day student tickets (50% off, except Seat F & Z ): Sold at the NNTT Box Office and some Ticket Pia outlets on the performance date. One ticket per person. No phone reservations. Students must bring a valid student ID. NNTT present two of the greatest works of verismo opera, Cavalleria Rusticana and I Pagliacci ,with stage set common to both operas and costumes at 1950s. In an atmosphere deeply colored by provincialism and religion, both operas feature music in which emotions are sung openly, and drama that rises with tension, passionately and intensely driving at the heart. 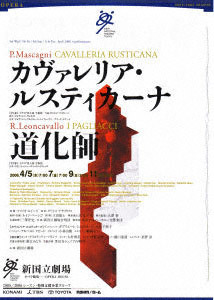 Cavalleria Rusticana follows its characters from the entanglement of infidelity to a deadly duel. The highlights include Santuzza's anguish-filled aria "Voi lo sapete, o mamma," and the beautiful yet grief-laden intermezzo. I Pagliacci, featuring Canio's magnificent aria "Vesti la giubba," is a tragedy in which a clown goes mad over suspicion of his wife's unfaithfulness and kills her. The conductor is Fabio Luisi, who was appointed as Principal Conductor of the Wiener Symphoniker in the autumn of 2005. With a wonderful cast that includes G.Schnaut, A.Cupido and C. Franz, an orchestra and chorus worthy of backing up this passion-filled music, it is sure to be an unforgettable performance. Turiddu, who is betrayed by his lover Lola, seduces Santuzza in revenge. However, unable to forget Lola, Turiddu and she start an affair. In a fit of jealousy, Santuzza tells Lola's husband, Alfio, about the affair, causing Alfio to challenge Turiddu to a duel. Truiddu bids his mother farewell and heads to the duel and his death. 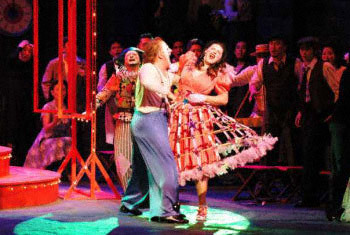 Nedda, wife of traveling show leader Canio, falls in love with Silvio, a young villager. While knowing of his wife's unfaithfulness, Canio prepares for a play musing bitterly, "Even when I weep sad tears, I have to play the clown." 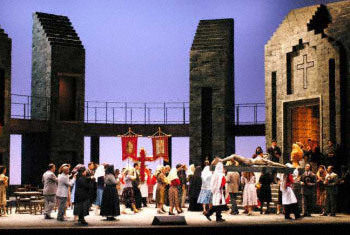 During the performance, while Nedda is acting the role of an adulteress, Canio goes mad, no longer being able to distinguish the play from reality, and stabs his wife to death.